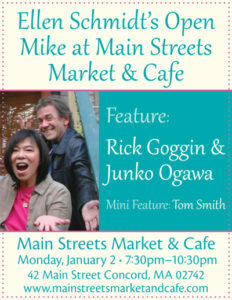 Ellen Schmidt's Open Mike Feature: Rick Goggin and I will be performing a feature and kicking off the new year! Laryngitis got a hold of me . I will not be joining the stage with Craig Sonnenfeld at The Java Room on Friday, Jan. 20th. Thank you, John Ferullo for stepping in and performing. The duo performance feature with Rick Goggin scheduled for Saturday morning, 1/21 at HCAM (Hopkinton Cable TV) –Wake Up and Smell the Poetry hosted by Cheryl Perreault will be postponed to the next season. Thank you John Boehmer for stepping in and performing in our place. Special thanks to Cheryl Perreault and Rick Goggin for their support and understanding. 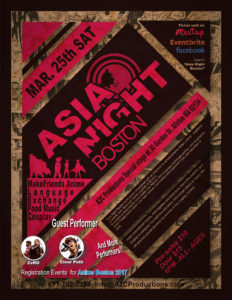 Performing with Rick Goggin and taking part at this cultural event. I will be one of the features performing original songs and telling the stories of songs. Unfortunately, Junko has had a setback and regrets that she needs to cancel. The Lenny Solomon Band will perform the whole evening. Chris Lee will perform in Junko's place and share the stage with Branson Bofat while Junko is recovering from her recent setback. Pepperell, MA For more info please see the festival website. J.O. Trio goes on to the stage from 1:30pm - 2:00pm. Festival runs from 9:00am to 4:00pm, with live music all day. Due to the weather, This show is CANCELLED. 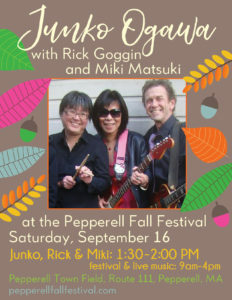 Junko will be sharing the stage with Mike Delaney, Chris Lee and Rick Goggin. 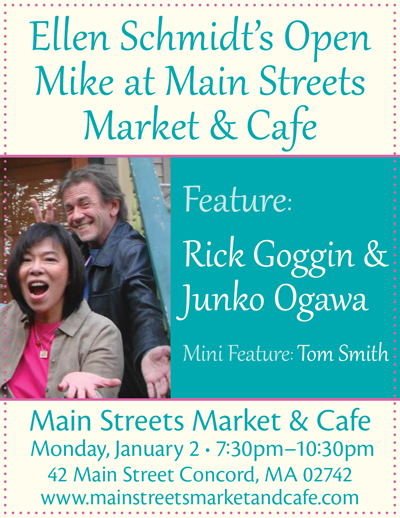 This is the rescheduled performance with Rick Goggin as a one of the features. Filming in front of live audience.